Chronic hip pain affects thousands of people in the United States, and it is more common with advancing age. The hip joint is an important part of the human anatomy. This joint allows for everyday normal movements, such as standing upright, walking, and sitting. The hip joint also supports and balances the trunk. The hip is a ball-and-socket joint, with the acetabulum (shallow curve of the pelvis) being the socket, and the round ball of the thighbone (femur) being the ball. These structures are coated with articular cartilage, which allows for a smooth gliding movement. Cartilage is flexible and resilient, similarly to connective tissue. A bag-like structure containing synovial fluid surrounds the joint, and this prevents friction between bone surfaces. Osteoarthritis is a condition associated with advancing age. This condition occurs from wear-and-tear of the cartilage and joint. As a person ages, and from trauma, the joint loses normal cushioning ability, and this produces hip pain. OA affects the hip by loss of molecular structures that compose the bones and reductions or impairments of normal hip joint function. Another condition caused by thinning bones is osteoporosis. This increases a person’s risk for hip fracture, which is associated with advancing age. Fractures will likely decrease functional status and quality of life. 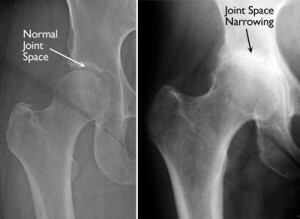 Bone loss affects the femoral head of the thighbone, which can lead to frequent dislocations. The femoral head is still elongating in the teen population (at the growth plate). This growth plate is subject to injury and damage, which is known as a slipped capital femoral epiphysis. SCFE is associated with serious complications, such as avascular necrosis or juvenile arthritis. These conditions all cause hip pain. Femoroacetabular impingement is a condition that causes excessive friction between bony joint surfaces. This results in serious pain and disability. FAI is often seen in younger people who engage in athletic activities or sports. The impingement can occur when excessive bone growth takes place around the femoral head, or due to increased bone growth within the socket of the joint. Ankylosing spondylitis is a progressive form of arthritis that leads to chronic inflammation of the sacroiliac joints and lower spine. This condition causes stiffness, pain, and aching of the pelvis and hips. AS is caused by vertebrae (spine bones) fusing together due to ligament and disc calcification. Tendons surround the hip and connect muscles to the joint. If you participate in sports or strenuous activities, you are at risk for tendon inflammation. Tendinitis causes pain and tenderness along the outside of the joint. Bursitis is a condition affecting the small fluid-filled sacs that surround the hip joints. With inflammation, this region produces pain and stiffness. This condition is a chronic and progressive autoimmune disease. With RA, the joints become inflamed, which produces stiffness, deformities, and serious pain. 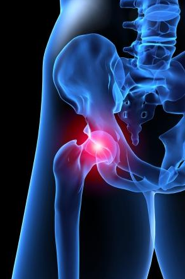 Patients with RA hip pain often have radiating discomfort to the thigh and groin region. The front aspect of the hip can become painful in women from femoral and inguinal hernias in the grown. These hernias often result from a strain or tear of soft tissue of the lower abdomen and groin region. Sports hernia often occurs during aggressive sporting activities. Many people with hip pain do not even realize they have a hernia. A pinched nerve occurs when too much pressure is applied by surrounding tissues, such as muscles, bones, tendons, and cartilage. This pressure interrupts a nerve’s normal function, which causes numbness, weakness, and pain. Pinched nerves are common causes of hip pain.